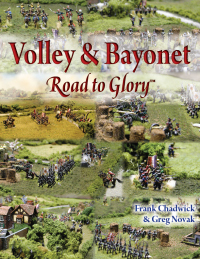 One of the strengths of Volley & Bayonet is the ability of refighting historical battles. Further, the rules for me capture both the feeling of a major battle yet retaining sufficient detail that I know I’m fighting a Napoleonic battle. In fact picking up a description of these famous battles and I’m struck by the fact the the authors dialogue could equally be describing last week’s Volley & Bayonet game. Over the years I’ve refought a reasonable number of battles using the rules. But one I haven’t played is Borodino. The other week I was contacted by email regarding the availability of the Borodino Scenario which, like several others, has been off-line while I reformat them. While reformatting is a slow process at the best of time, the email encouraged me to push this scenario further up the queue. After a several hours work I’m pleased to report Geoffrey Wootten’s epic Borodino Scenario is again on-line. It includes a few minor updates to align it with the latest edition of the rules, but is otherwise unchanged. In many ways Borodino needs no introduction, yet perhaps it does. For me David Chandler places it into context in his “The Campaigns of Napoleon”. Napoleon had at his disposal around 124,000 infantry, 24,000 cavalry and 587 cannon. The Russians 72,000 infantry, possibly 10,000 militia, 24,000 cavalry including Cossacks, and 640 cannon. During the course of the battle Chandler notes the French alone would fire 90,000 artillery rounds and perhaps two million infantry cartridges during the day. The result would be almost 30% of those engaged would become casualties. Now, if you are thinking of refighting Borodino you will be wondering how many figures will be required. Well a quick review of Geoffrey’s scenario suggests you will need the 43 stands of French and allied infantry, 32 stands of French and allied foot artillery, around 10 stands of horse artillery and a respectable 26 stands of cavalry. The Russians on the other hand will require 45 stands of infantry, 5 stands of militia, some 49 stands of artillery and 20 stands of cavalry. Not a small number, yet certainly achievable. That said I’m woefully short of Russians with a paltry 17 stands of foot artillery based. Enough of an introduction. You can find Geoffrey’s fine scenario here, or under the Napoleonic Scenario Section of this site.